These are the first of a series of long-exposure images that will continue through early March, with the purpose of refining the team’s knowledge of the moons’ orbits. 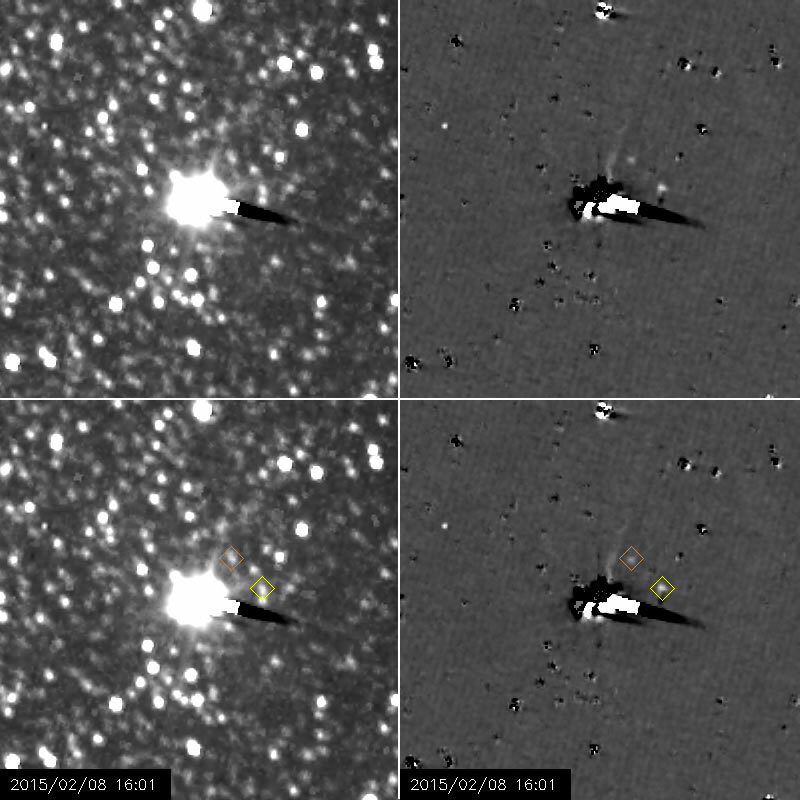 Each frame is a combination of five 10-second images, taken with New Horizons’ Long-Range Reconnaissance Imager (LORRI) using a special mode that combines pixels to increase sensitivity at the expense of resolution. At left, Nix and Hydra are just visible against the glare of Pluto and its large moon Charon, and the dense field of background stars. The bright and dark streak extending to the right of Pluto is an artifact of the camera electronics, resulting from the overexposure of Pluto and Charon. As can be seen in the movie, the spacecraft and camera were rotated in some of the images to change the direction of this streak, in order to prevent it from obscuring the two moons. The Johns Hopkins University Applied Physics Laboratory manages the New Horizons mission for NASA's Science Mission Directorate in Washington. Alan Stern, of the Southwest Research Institute (SwRI), headquartered in San Antonio, is the principal investigator and leads the mission. SwRI leads the science team, payload operations, and encounter science planning. New Horizons is part of the New Frontiers Program managed by NASA's Marshall Space Flight Center in Huntsville, Alabama. APL designed, built and operates the spacecraft. Image credits: NASA/Johns Hopkins University Applied Physics Laboratory/Southwest Research Institute.